Download "KEY FEATURES OF SOURCE CONTROL UTILITIES"
3 To place into RCS control type: ci RCS/,v <-- enter description, terminated with single '.' or end of file: NOTE: This is NOT the log message! >> Enter a description of this version, for example, type: Created dataset demog To save enter. (period) initial revision: 1.1 done RCS just stated you that was placed under RCS control. Note that the program is no longer located in the directory. However, in the RCS directory there is a file,v. By looking at the contents of this file this will not be the original testing file. Instead, the file will contain special codes that RCS uses to keep track of the file. RCS automatically starts version numbering at 1.1, but there are options of using names instead of versions. That's all, the file is now being managed by RCS. To open as read - only type the following command: co -kv The -kv option allows RCS to update the header without extraneous characters. Open the program and notice that information in the header was automatically updated! To modify the file and create the next version of this program, open the file in edit mode by typing: co -l The -l option locks the file so that only one person can edit it at a time. 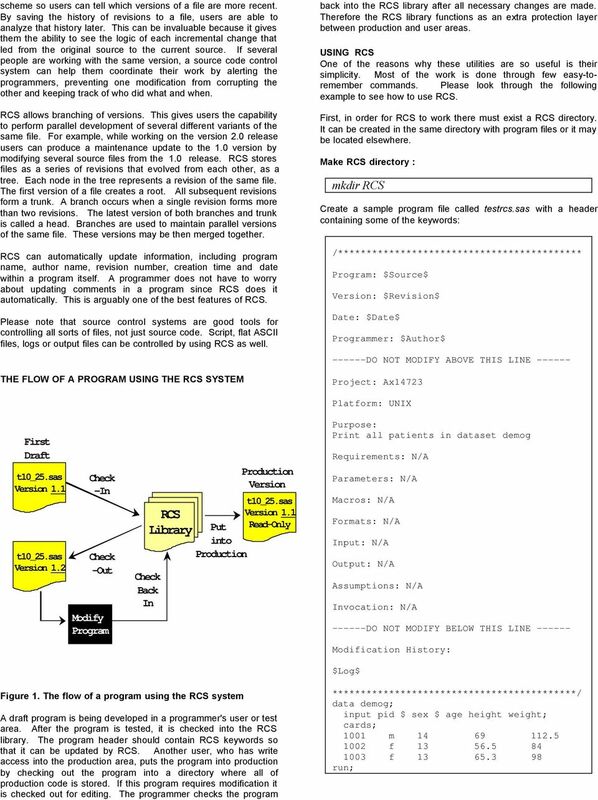 RCS will display the following message: RCS/,v -->.c revision 1.1 (locked) done Modify the program by adding a simple proc print statement: proc print data=demog; run; the program back into the RCS by repeating the ci command: ci RCS/,v <-- new revision: 1.2; previous revision: 1.1 enter log message, terminated with single '.' or end of file: Notice that the version number was incremented to 1.2. If the program was checked out and then checked back in with changes, RCS will make it version 1.3. See the example below. out again and notice that it's header was updated as follows: /******************************************* Program: C:\SUG/RCS/,v Version: 1.3 Date: 2000/02/22 18:33:51 Programmer: CHERNM DO NOT MODIFY ABOVE THIS LINE Project: Ax14723 Platform: UNIX Purpose: Print all patients in dataset demog Requirements: N/A Parameters: N/A Macros: N/A Formats: N/A Input: N/A Output: N/A Assumptions: N/A Invocation: N/A DO NOT MODIFY BELOW THIS LINE Modification History: Testrcs.sas,v Revision /02/22 18:33:51 CHERNM02 Added title to proc print Revision /02/22 18:33:25 CHERNM01 Added proc print Revision /02/22 18:32:54 CHERNM01 Initial revision *******************************************/ One of the most powerful features is the ability to check out any version of a program. This is done by using the -r option. For example, let's assume there are three versions of and we need to edit the second version. This version is numbered by RCS as version 1.2. 4 Type the following command to check out an earlier version: co -l -r1.2 This will open the second revision of in edit mode. Note that RCS will number the next version of as version instead of 1.4. All subsequent changes to that version will be branched out. Accordingly, a change to version 1.2 will create a version 1.3 (See figure 2). Version 1.3 Head Version 1.2 Branch start Root Figure 2. Tree of revisions OTHER USEFUL COMMANDS Use RCS rlog command to see a document's revision history: rlog It will produce the following output : Version Branch head Version Branch node RCS file: RCS/,v Working file: head: 1.3 branch: locks: strict access list: symbolic names: keyword substitution: kv total revisions: 3; selected revisions: 3 description: Initial version revision 1.3 date: 2000/02/22 16:09:31; author: chernm02; state: Exp; lines: +7-3 Added title to proc print revision 1.2 date: 2000/02/22 16:08:06; author: chernm01; state: Exp; lines: Added proc print revision 1.1 date: 2000/02/22 16:07:14; author: chernm01; state: Exp; Created dataset demog RCS can show all files currently being edited by the users: rlog -L -R RCS/* This will produce a list of files currently being edited: RCS/,v As you can see, RCS is easy to use, but each of its commands have many different options. On UNIX read the man pages for all of the options. AUTO-DOCUMENTING HEADERS No program is complete without proper documentation. Any source program should contain, at a minimum, information about its author, last modification date, program name, and a description of the code and all the changes that have been made to the code. Unfortunately, many programs are not sufficiently documented. Manytimes even if there are comments in a program, these comments may not be up to date. Also, many programmers forget to comment on all changes they make to a program. RCS may help to ensure the proper documentation of source code. It allows users to insert certain keywords into working files. These keywords all have special meaning. 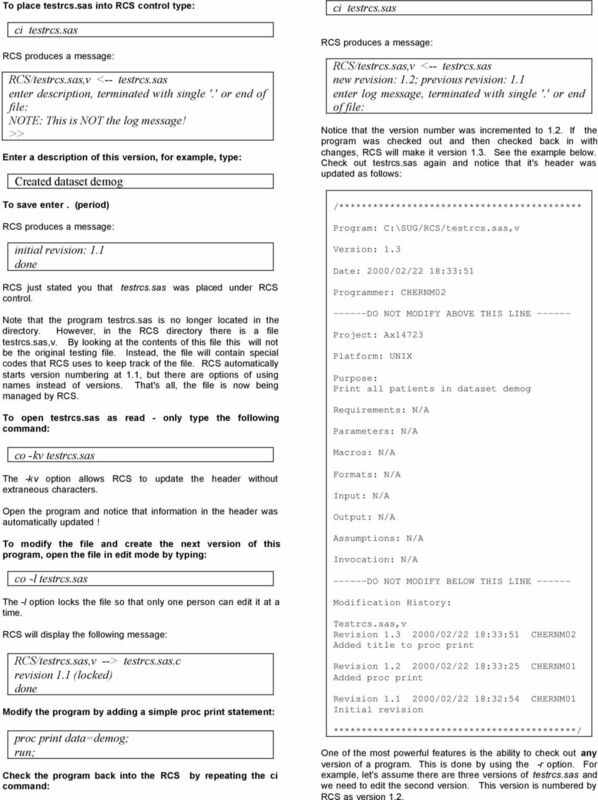 Each special keyword is inserted into a comment in the original version of a program. When these keywords are in a file during a check out, a check out command updates the value of each keyword with the information stored in the RCS library. The most useful RCS keywords are: $Source$ $Author$ $Date$ $Revision$ $Log$ The $Log$ keyword corresponds to the comments which are entered during a version check in. These comments will be then automatically inserted into a program. Therefore, a programmer will no longer have to be concerned with updating the main documentation in the program because RCS will do most of the work. It will automatically update any file information as long as the proper RCS keywords are used within a comment. A programmer will never forget to describe changes to a program because RCS forces a programmer to describe changes to programs every time it is checked in. Needless to say, it is still the responsibility of a programmer to properly document a program. IMPLEMENTING A VERSION CONTROL SYSTEM IN YOUR COMPANY It is very easy to start using a version control system in your company. 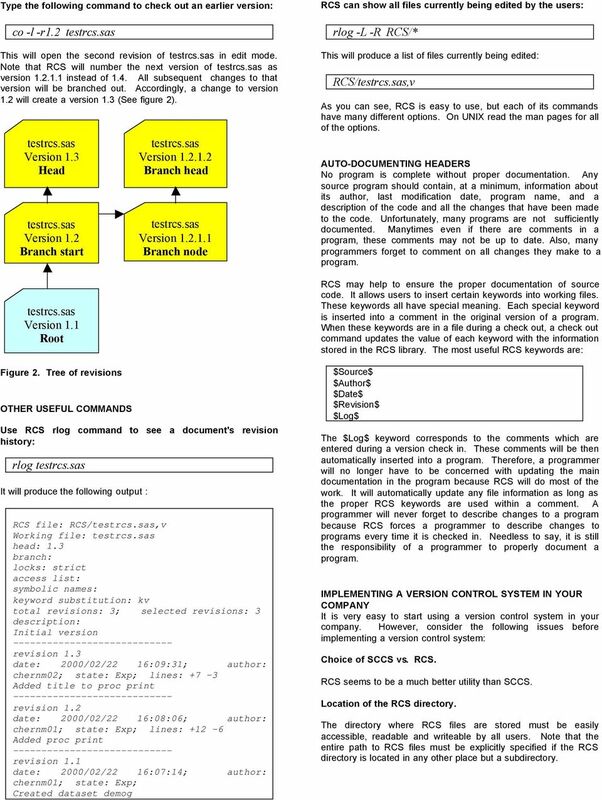 However, consider the following issues before implementing a version control system: Choice of SCCS vs. RCS. 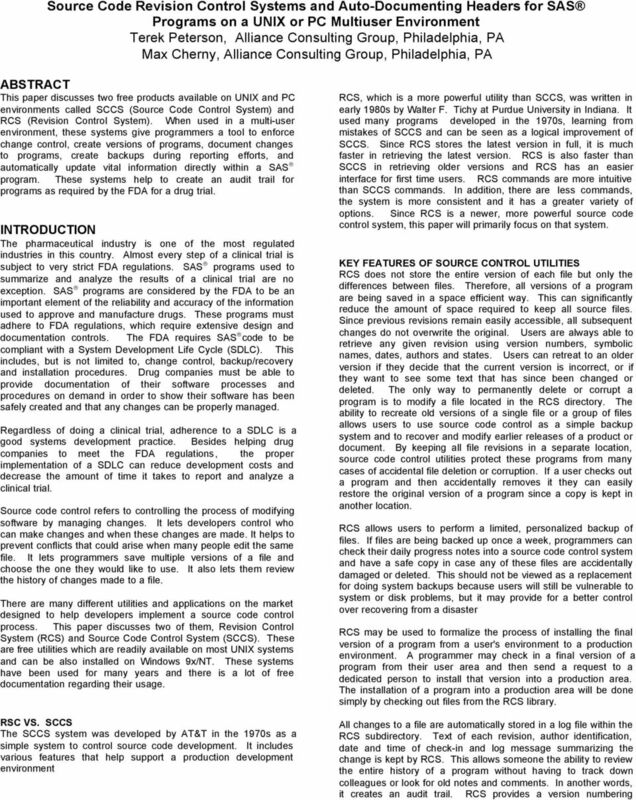 RCS seems to be a much better utility than SCCS. Location of the RCS directory. The directory where RCS files are stored must be easily accessible, readable and writeable by all users. Note that the entire path to RCS files must be explicitly specified if the RCS directory is located in any other place but a subdirectory. Implementing an Audit Trail within a Clinical Reporting Tool Paul Gilbert, Troy A. Ruth, Gregory T. Weber DataCeutics, Inc. User s Manual. Version 4.0. Levit & James, Inc.
Planning for a Disaster Using Tivoli Storage Manager. Laura G. Buckley Storage Solutions Specialists, Inc.
LUKE KANIES using version control in system administration Luke Kanies runs Reductive Labs (http://reductivelabs.com), a startup producing OSS software for centralized, automated server administration. WHITE PAPER Achieving Continuous Data Protection with a Recycle Bin for File Servers. by Dan Sullivan. Think Faster. Visit us at Condusiv.